(Nanowerk News) A UT Dallas researcher envisions a time soon when plastic sheets of solar cells are inexpensively stamped out in factories and then affixed to cell phones, laptops and other power-hungry mobile devices. And a new $330,000 grant from the National Science Foundation should help him come closer to realizing that vision. Many researchers are investigating the development of flexible solar cells in hopes of improving efficiency and lowering manufacturing costs, however Walter Hu’s novel approach would use nanoimprint lithography to produce precisely nanostructured devices rather than using chemical methods of manufacturing. 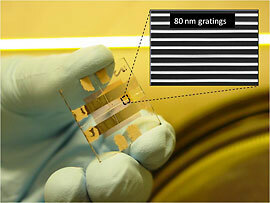 A researcher holds a sample of prototyped solar cells. The inset is an electron micrograph of the nanostructures. Nanoimprinting is an emerging technology that’s been used to produce various electronic and optical devices by imprinting the pattern from a mold onto a surface. But Dr. Hu’s team is exploring how the thermal imprinting can not only impart a pattern to the solar cell material but also change properties of the material in ways that maximize light absorption, increasing the efficiency of the resulting cells well beyond what anyone has done to date with these so-called organic solar cells. That requires exploring all of the interrelated properties of the solar cell material’s plastic polymer surface (such as crystallinity, molecular orientation, stability and thermal dynamics) and their correlation with geometry, imprint conditions, surface effects and the quantum efficiency of the resulting solar cells. “Scientifically, we would like to understand – materials-wise, engineering-wise – how we can solve the problem of engineering materials at the nanoscale to improve solar cell performance,” said Dr. Hu, an assistant professor of electrical engineering in the Erik Jonsson School of Engineering and Computer Science at UT Dallas. Understanding these basic questions is important to developing new methods to improve the power conversion efficiency as well as the stability of next-generation solar cells, he added. His team is collaborating with J.C. Hummelen at the University of Groningen, Netherlands, who is internationally recognized for the creation of PCBM, a popular nanomaterial for organic solar cells. Dr. Hummelen will customize those materialls to fit the nanoimprint process. Dr. Hu’s group also works closely with Anvar Zakhidov, a renowned expert in solar cells at the UT Dallas Nanotech Institute, to study various material systems and device architectures. Dr. Hu’s team is also addressing energy payback, which is the time needed once a solar-cell system is operable to both recover the amount of energy used to manufacture it and offset carbon emissions from that manufacturing. Conventional silicon-based solar cells are manufacturing-intensive. The energy payback for these systems is two to four years. The organic solar cells his team is developing would have an energy payback that can be measured in a few months.